WOMEN’S shearing competitions will be held at New Zealand’s major championships’ early next year as their sport caters to growing numbers of women and capitalises on the success of new docu-movie She Shears. The events are being planned for the Golden Shears on February 28-March 2 and the New Zealand Shears on March 28-30, and are expected to be a step up from the novelty value attributed to the occasional invitation events held previously. There have been invitation events in the past, but answering calls from competitors to run the real deal, as opposed to occasional “novelty” events, the New Zealand Shears event will be a particular breakthrough with heats and a final, competition president Claire Grainger said. Emily Welch in the 2007 Golden Shears senior final, finishing a ground-breaking runner-up, the highest senior placing claimed by a women in Golden Shears shearing. Photo – Pete Nikolaison. Golden Shears president Sam Saunders said its women’s event will be held at the big event in Masterton for six shearers qualifying from their points in the championship grades. Like about 20 other competitions throughout the country, both championships have wool handling events which are dominated by women, but last season Shearing Sports New Zealand recorded 32 women contesting shearing finals across the senior, intermediate, junior and novice classes around the 57 shows nationwide – more than 15 percent of finalists in those classes. The events follow a push from Waikaretu couple and world record breakers Sam and Emily Welch, aiming to eventually have women’s national and world titles. 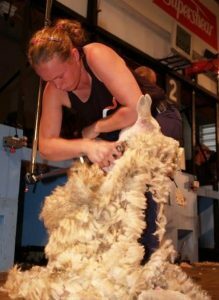 Emily Welch’s 2007 Golden Shears Senior second placing was the highest achieved by a woman in that grade at the world leading championships held in Masterton every year since 1961. The only shearing championship wins by women in the 58 years of the Golden Shears were junior wins by Canadian shearer Fiona Nettleton in 1988 and Southern Hawke’s Bay farmer Jane Leogreen in 1995, and four wins in the 20 years of 20 novice finals. Welch, beaten in that final only by eventual national Open-grade circuit champion and New Zealand representative Angus Moore, went on to set a women’s world record of 648 lambs in nine hours later in 2007. Taking time out to raise a family, returning to win an invitation women’s event in 2015 and competed in the 2017 open heats as part of the making of She Shears, which follows the paths of five female shearers, she confirmed she’ll pick-up the handpiece again to prepare for the new challenges. Welch featured in She Shears with shearer-turned lawyer, Jils Angus Burney, Catherine Mullooly, from Matawai, Alexandra’s Pagan Karauria, who came back from major crash injuries to become a champion woolhandler and a Senior shearer, and up-and-coming Hazel Wood, from Ruawai in Northland..
Other women have won senior events throughout the country, most notably Angus Burney and 2006 Golden Shears Novice winner Te Atakura Crawford at the New Zealand Merino Shears in Alexandra, and Mullooly, who in No 1 became the first woman to get a No 1 Shearing Sports New Zealand ranking. The top Intermediate then won the Poverty Bay and Hawke’s Bay shows senior finals in 2015, and the Scottish Blackface Championships Senior final at Lochearnhead, Scotland, in 2017. In April she was runner-up in the New Zealand Championships Senior final in Te Kuiti. She was also runner-up to Welch in the 2014 Golden Shears Women’s Invitation event which also included Crawford and Angus Burney, and successful Junior and Intermediate shearer Sarah Goss, now a Black Ferns rugby star and captain of the New Zealand women’s Sevens team. Just four months later Mullooly won a women’s event in front of Princess Anne at the Great Yorkshire Show in England. Another who has strung up the successes has been Laura Bradley, of Woodville, who topped the rankings as a Junior in 2015 and as an Intermediate two seasons later, when she won four of her 17 finals which included 2017 third-placings at both the Golden Shears and New Zealand championships.